Pre-feasibility Study (the Study) indicates US$293 million after-tax net present value (NPV), using a 10% nominal discount rate, and 36% after-tax internal rate of return (IRR) for the Songwe Hill Rare Earth Project (the Project), based on rare earth oxide (REO) prices equivalent to a total rare earth basket price for Songwe Hill of US$55.0 per kg REO. The basket price reflects the selective removal of a large proportion of the cerium during the hydrometallurgical process which enhances the value of the product mix. Initial capital expenditure (Capex) of US$217m, including a contingency of US$20m, is among the lowest in the rare earth sector. Cash operating costs average US$13.4 per kg REO1 for the first 5 years of production and US$17.0 per kg REO1 for the life of mine. The Study assumes an additional cost of US$10.0 per kg REO1 to account for the cost or discount associated with toll separation or the sale of a mixed chemical concentrate. The Study supports the declaration of a maiden Probable Mineral Reserve Estimate of 8.5 million tonnes grading 1.60% TREO for the Project and is based on an open pit operation, using contract mining, with a mine life of 18 years commencing in 2017. There is potential to significantly expand production or the mine life and for a lower strip ratio given the large additional Inferred Resource and potential to expand the Mineral Resource. This first phase of development envisages production of a high grade, critical and heavy rare earth enriched, purified chemical concentrate for toll treatment or sale, with annual production of approximately 2,840 tonnes per year of REO in concentrate1. William Dawes, Chief Executive Officer of Mkango stated: "This is a major milestone in the development of the Project. Since listing in 2011, Mkango has progressed an early stage exploration project to one of only three rare earth projects in Africa with a Pre-feasibility Study or Feasibility Study announced. We are very encouraged by the Project's strong returns and relatively low capex." Alexander Lemon, President of Mkango stated: "With the ongoing support of the Ministry of Natural Resources, Energy and Mines as well as the communities surrounding the Project, the Nation of Malawi has the potential to be a leading sustainable producer of rare earths on a global scale. We are proud to be spearheading this initiative with the Government and people of Malawi." The Study is based on a conventional open pit operation using contract mining, a mine life of 18 years commencing in 2017, and is focused on the Probable Mineral Reserve Estimate. Unless specified otherwise, costings have been undertaken at an accuracy level of +/- 25%. The Project features broad zones of outcropping rare earth mineralisation on the northern slopes of a steep sided hill. The annual processing capacity was assumed at 500,000 tonnes per year of ore with a view to producing an average of approximately 2,840 tonnes of REO in mixed chemical concentrate per year with a large proportion of the cerium removed during the hydrometallurgical process. Cerium is currently considered to have challenging market fundamentals and, under Mkango's current strategy to produce a concentrate, there is a strong economic rationale to remove as much as possible of the cerium from the final concentrate. It is currently envisaged that the product of the operation in Malawi will be a high grade, heavy and critical rare earth enriched, purified chemical concentrate. The Project is connected by road to Blantyre, the largest commercial centre in Malawi located approximately 70 km away, and which has a rail head and international airport. For the purposes of import of reagents and export of product, it is assumed that the Project will utilise the existing road and rail network, in addition to the new railway being completed through Malawi to the Nacala port in Mozambique. A detailed financial model was constructed based on input parameters from the Study. Free cash flows were modelled in both real and nominal terms for a range of discount rates, and on a debt free basis. 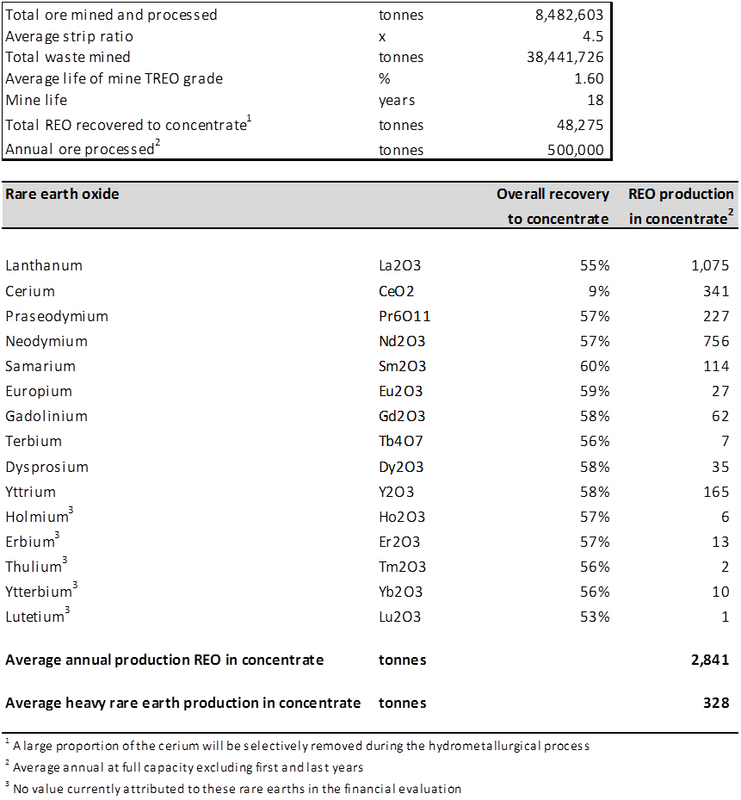 Long term rare earth price assumptions were based on an average of those included in Feasibility Studies and Pre-feasibility Studies announced by peer group companies in the rare earth sector in 2013 and 2014, resulting in the equivalent price for a total rare earth basket for Songwe Hill of US$55.0 per kg REO. Prices are assumed to remain flat in real terms over the life of the mine. The main revenue drivers are neodymium (37%), dysprosium (14%), praseodymium (13%) and europium (18%) as illustrated below. Cash operating costs include the costs of contract mining, milling, flotation, leaching, purification and precipitation in addition to other costs associated with the operation. The Study also assumes an additional cost of US$10.0 per kg REO to account for the cost or implied discount associated with toll separation or the sale of a mixed chemical concentrate. 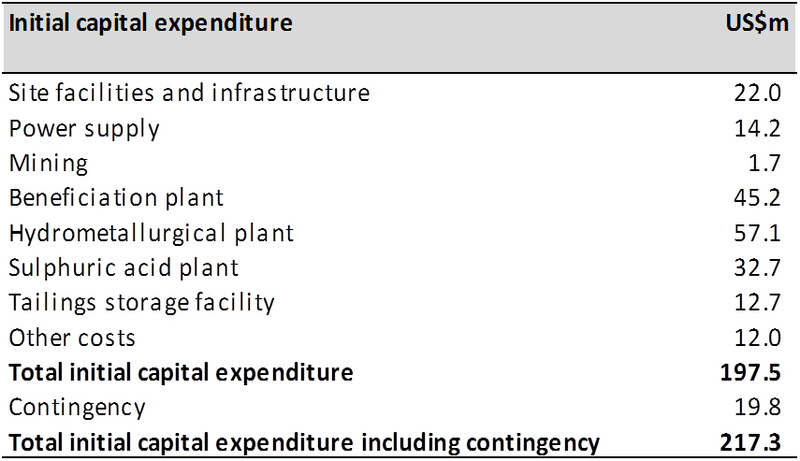 The largest capital expenditure (capex) component is an integrated processing plant comprising a mill, flotation plant, hydrometallurgical plant, and a sulphuric acid plant with power co-generation capacity. The capex estimate for the integrated processing plant was completed by SNC-Lavalin (Pty) Ltd. and is to an accuracy defined as (-20 % +25 %) covering the design, engineering, procurement, supply/manufacture, construction and pre-commissioning of the proposed new processing facility and associated plant complex infrastructure. Other major capex items include the cost of a lined tailings storage facility provided by Epoch Resources (Pty) Ltd.
Total initial capital expenditure is US$217.3m including a contingency of US$19.8m. 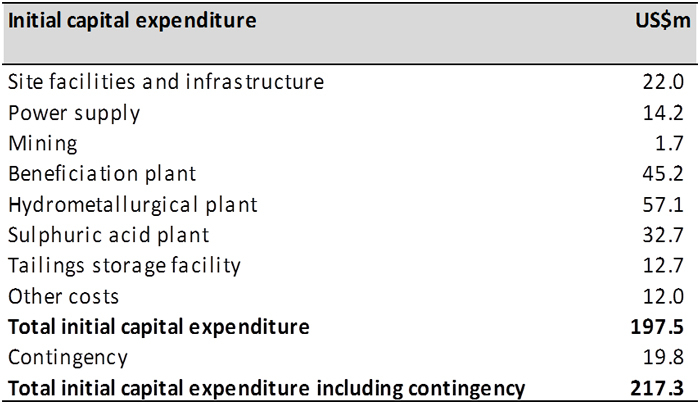 Capital expenditure after initial Project development costs are estimated to be US$1m per year for sustaining capital. The costs of future reclamation are assumed to be provided for by Mkango on an annual basis for the life of the mine and are included in operating costs (G&A / other). The Study is based on the NI 43-101 Mineral Resource estimate in the Technical Report (the "Report") entitled "NI 43-101 Technical Report and Mineral Resource Estimate for the Songwe Hill Rare Earth Element (REE) Project, Phalombe District, Republic of Malawi" filed on 22 November 2012 and authored by Scott Swinden, Ph.D, P.Geo. and Michael Hall, Pr.Sci.Nat., MAusIMM (who are independent "Qualified Persons" in accordance with National Instrument 43-101 - Standards of Disclosure for Mineral Projects) and prepared by The MSA Group (Pty) Ltd. The Report's Mineral Resource Estimates, as previously announced, are summarized below. The Study supports the declaration of a Mineral Reserve Estimate for the Project as summarized below. TREO - total rare earth oxides including yttrium. The economic parameters used for calculating the Mineral Reserve Estimate may vary from those used in the economic model for the Study. Indicated Mineral Resources are inclusive of Mineral Reserves. Mineral Resources that are not Mineral Reserves do not have demonstrated economic viability. For further details of the Mineral Resource estimates, including the breakdowns thereof, please refer to the Report which is available at www.sedar.com. The mine design was completed by The MSA Group (Pty) Ltd. It is based on a conventional open mining operation and assumed the use of a contract miner. The mine plan incorporates the use of stockpiles to manage the grade profile and maximize returns. As part of the Study, a contract mining company visited the Songwe Hill site and was integrally involved in the estimation process. A comprehensive three year program of mineralogical studies formed the basis for the metallurgical testwork. Mineralogical work included investigations by High Definition Mineralogy incorporating QEMSCANTM completed by SGS Minerals Services and Camborne School of Mines, scanning electron microscope (SEM), electron microprobe and Laser Ablation Inductively Coupled Plasma Mass Spectrometry (LA-ICP-MS) analyses completed at the Natural History Museum, Aberystwyth University, Camborne School of Mines and the British Geological Survey. Further mineralogical work (SEM) on mineral concentrate was completed at Mintek and the Camborne School of Mines. The mineralogical program identified the fluorocarbonate mineral, synchysite, and the phosphate mineral, apatite, as the most important rare earth bearing minerals, and confirmed that the apatite contained significantly higher concentrations of heavy rare earths and yttrium relative to apatite in other carbonatites worldwide. Songwe Hill's favourable mineralogy means that high capital and energy intensive kilns will not be required in the flow sheet. This contrasts to projects dominated by monazite, xenotime or other refractory REE minerals. Plant design comprises conventional technology largely comprised of tanks, pumps and filters, and will be modular, facilitating the potential for future expansions, the latter underpinned by a significant Mineral Resource base. The use of low strength acid enables the use of plastics or composite materials for tanks and pipework. The design of the integrated processing plant and associated infrastructure was completed by SNC-Lavalin (Pty) Ltd. The metallurgical testwork was completed by Mintek, South Africa and Nagrom Laboratories, Australia, which was reviewed and supervised, respectively, by Met-Chem Consulting (Pty) Ltd., Australia. A number of potential flow sheets were evaluated at Mintek and Nagrom Laboratories. Based on this testwork, a flowsheet was developed incorporating flotation, two stage leaching and acid regeneration. The flotation process was largely developed at Mintek and then reproduced and verified at Nagrom Laboratories. This work demonstrated that flotation can be used to upgrade the mineralised material. In the flow sheet, this concentrate is then treated in the hydrometallurgical plant. In the first leach step (gangue leach), dilute hydrochloric acid (HCl) is used to remove largely calcite, with minimal rare earth losses. A solution amenable for recycling HCl using sulphuric acid is thereby produced. This process has considerable merit in that sulphuric acid is considerably cheaper to produce versus the cost of importing HCl. Solid sulphur will be transported to site and used to produce concentrated sulphuric acid along with co-generation of power from a combined sulphur burner and steam turbine plant. HCl lost during the process will be replaced by importing solid calcium chloride. The residue from the gangue leach is then subjected to a second, more intensive HCl leach during which the majority of the rare earths are solubilised. 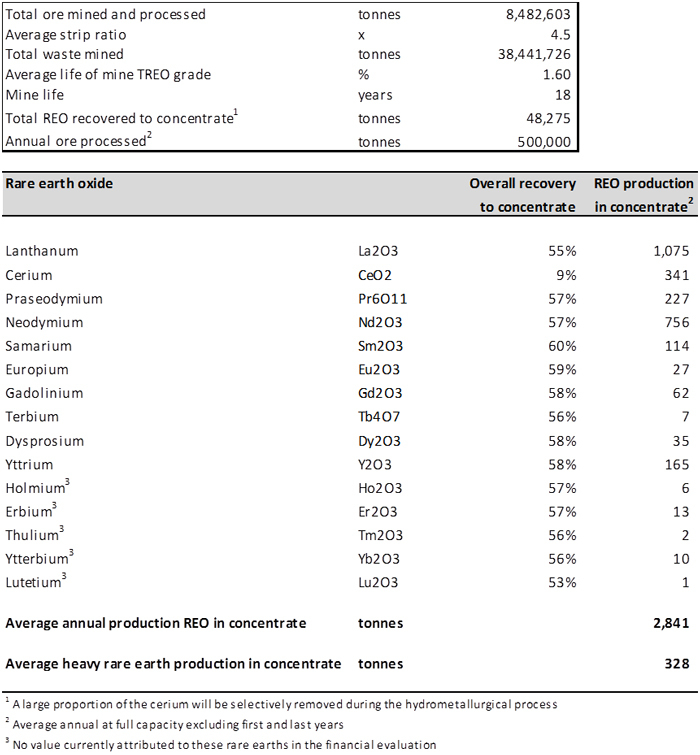 In addition, caustic conversion followed by HCl dissolution is completed on the rare earth leach residue to maximise overall rare earth leach recovery. The resultant pregnant liquor solution reports to the purification stage, during which impurities are removed and cerium is selectively precipitated for stockpiling and potential future sale. Pre-feasibility environmental and social baseline studies were conducted during 2013 by Digby Wells Environmental in consultation with Malawian environmental specialists, based on the requirements of the Equator Principles, International Finance Corporation (IFC) Performance Standards as well as specific requirements and interpretations of Malawian Legislation as provided by their Department of Environmental Affairs (DEA). A Project Brief for the proposed environmental and social studies for the Environmental, Social and Health Impact Assessment (ESHIA) was submitted to the DEA in the fourth quarter of 2013. The DEA has responded with a suggested Terms of Reference which will be addressed in the ESHIA for the Definitive Feasibility Study. An NI 43-101 Technical Report supporting the Study is being prepared by The MSA Group (Pty) Ltd. under the guidance of Rob Croll, Principal Consultant for The MSA Group (Pty) Ltd., who is a "Qualified Person" in accordance with National Instrument 43-101 - Standards of Disclosure for Mineral Projects. The Mineral Reserve calculation was completed by The MSA Group (Pty) Ltd. under the supervision of Clive Brown, who is a "Qualified Person" in accordance with National Instrument 43-101 - Standards of Disclosure for Mineral Projects. The process design and cost estimation for the integrated processing plant for the Study was completed by SNC-Lavalin (Pty) Ltd. under the supervision of Jansen Scheepers who is a "Qualified Person" in accordance with National Instrument 43-101 - Standards of Disclosure for Mineral Projects. The design and cost estimation for the infrastructure associated with the integrated processing plant for the Study was completed by SNC-Lavalin (Pty) Ltd. under the supervision of Tinus Redelinghuys who is a "Qualified Person" in accordance with National Instrument 43-101 - Standards of Disclosure for Mineral Projects. Scientific and technical information contained in this release in relation to metallurgical test work has been approved and verified by Mr Gavin Beer BSc. (Ext. Met.) MAusIMM (CP), Consultant Metallurgist, who is a "Qualified Person" in accordance with National Instrument 43-101 - Standards of Disclosure for Mineral Projects. The NI 43-101 compliant Technical Report in respect of the results of the Study described herein will be filed on SEDAR within the next 45 days. All of the Qualified Persons referred to in this Press Release are independent of Mkango Resources Limited. In parallel, the Corporation is also undertaking regional exploration in the second license area, known as Thambani, where a number of areas with potential for uranium, zircon, corundum and niobium have been identified. The Corporation's corporate strategy is to further develop the Songwe Hill rare earth deposit and secure additional rare earth element and other mineral opportunities in Malawi and elsewhere in Africa. This news release may contain forward-looking statements relating to the Corporation. Readers are cautioned not to place undue reliance on forward-looking statements, as there can be no assurance that the plans, intentions or expectations upon which they are based will occur. By their nature, forward-looking statements involve numerous assumptions, known and unknown risks and uncertainties, both general and specific, that contribute to the possibility that the predictions, forecasts, projections and other forward-looking statements will not occur, which may cause actual performance and results in future periods to differ materially from any estimates or projections of future performance or results expressed or implied by such forward-looking statements. Such factors and risks include, among others, the interpretation and actual results of current exploration activities; uncertainty of estimates of Mineral Resources and Mineral Reserves, changes in project parameters as plans continue to be refined; future commodity prices; possible variations in grade or recovery rates; failure of equipment or processes to operate as anticipated; labour disputes and other risks of the mining industry; delays in obtaining governmental approvals or financing or in the completion of exploration.